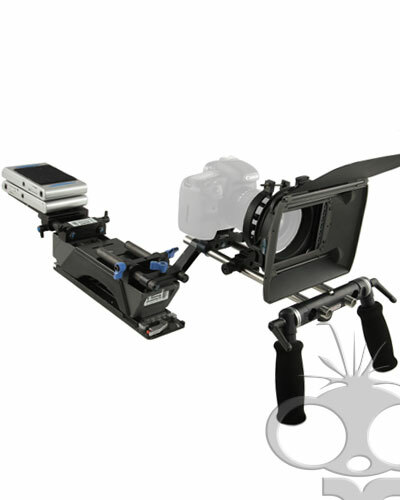 This is our custom version of the Redrock Eye Spy rig. The Ikegami shoulder mount allows for quick tripod to shoulder mount transitions, alongside improved support with Ronford Baker moose bars replacing the single handle. The rig takes the weight out of your hands and can provide a much more stable shot. The offset bracket moves the camera in front of the operators eye and also raises the LCD screen to allow for easy viewing. If you are using a camera with a battery grip add-on, we can replace the raised offset bracket with a flat version to bring the LCD screen in line with the operators eye at no extra cost. The Shoot n Go can be customised with a loupe for the LCD screen. The Zacuto Z-finder is available for £5 a day. Discounts apply for longer periods.